FSB arrested five members of a criminal group affiliated with the Islamic State. 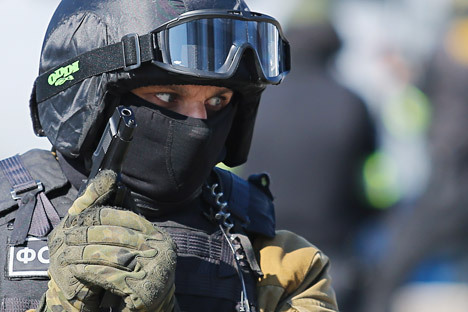 Russia’s Federal Security Service (FSB) has arrested five members of a criminal group affiliated with the Islamic State, suspected of plotting terror attacks in the Republic of Ingushetia and Moscow, the FSB press service told TASS on Nov. 15. "Russia’s Federal Security Service has thwarted the activities of a criminal group established to carry out terror and extremist attacks in the Republic of Ingushetia and Moscow. The group is affiliated with the Islamic State international terrorist organization," the press service said. Five firearms, two homemade explosive devices containing around 10 kilograms of TNT equivalent each, homemade electric detonators, some components of explosive devices and various types of ammunition have been seized from the suspected terrorists. A criminal case has been opened against the arrested persons for participating in the activities of a terror group outlawed in Russia.